In its latest report on Apple, Consumer Intelligence Research Partners (CIRP) surveyed a number of recent purchasers of Apple products to determine U.S. buyer's purchasing habits regarding preferred capacity and model of a variety of Apple products. Among other things, the survey found that the iPhone 5 accounted for just 52% of iPhones purchased in June 2013 -- back in October, just after the iPhone 5 had launched, the new device commanded some 68% of iPhone purchases. 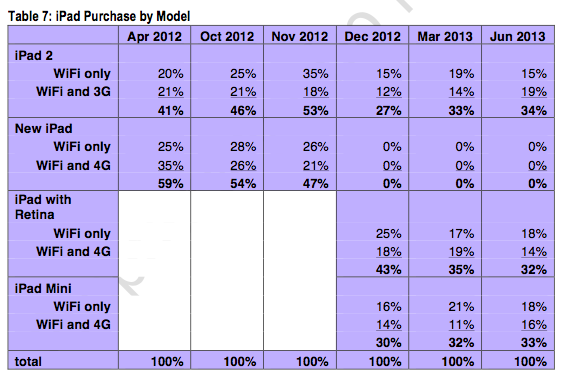 In June, 30% of iPhone sales were from the 4S, while 18% were from the 4. The iPhone 4 and 4S aren't the only older iOS devices to be seeing significant sales success. The iPad 2, which is particularly popular in educational and enterprise environments, accounted for 34% of total iPad sales in June. The Retina iPad and iPad mini each counted for a third of total sales. 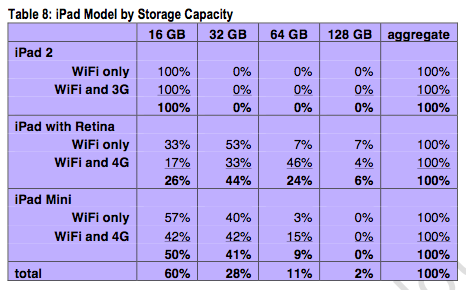 The 16GB capacity iPad is by far the most popular model, with the 32GB, 64GB and 128GB models accounting for 28%, 11% and 2% of total sales respectively. Finally, though the Mac Pro has not been significantly updated in several years, it still accounts for 5% of total Mac sales, according to the survey -- and is more popular than the Mac mini. The MacBook Pro makes up 70% of Apple's notebook sales, with more than half of those sales going to the Retina display-equipped models. 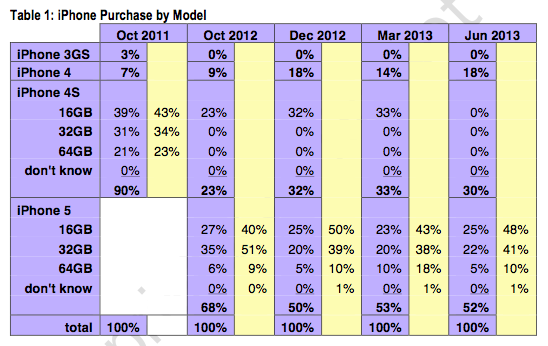 Apple does not break down sales by model, and though this data is from a survey and not company-provided, it gives some insight into the sales preferences of Apple's customers. Many people prefer having half their computer in their computer.
] and is more popular than the Mac mini. A 15" screen. 16GB of RAM. Quad-Core CPUs. Dual-Core CPUs > 1.7GHz. A Retina display. You know, Pro stuff. CDs/DVDs and Ethernet ports are still a thing and it has the lowest entry price point to the Pro line. All in, the 13" MBP still provides good value for budget buyers. Even more so if you're a student. Especially since the White MacBook disappeared. Not everyone wants to spend more to find external solutions for stuff that should arguably be built in already. Some like internal superdrive's, wired ethernet, FW and the ability to purchase industry standard HDD's/SSD's and RAM. I don't see what so appealing about a MBA. Mac Pro has higher performance, and is user upgradable. Some people want/need DVD-drives too, and don't want to mess with external crap. Edit: They also has more ports (Ethernet, Audio In, FireWire). iDevices aside, it's no surprise that the models that are still user upgradeable have the edge. I considered getting the rMBP, but when I saw that any memory increases or drive upgrades had to be done by Apple at initial purchase, I didn't buy. Still with my early 2011 15" MBP - picked the one with the fastest processor, with the standard amount of memory and hard drive size, then maxed the memory on my own, bought an SSD and pulled out the standard hard drive. No one wants to be forced to pay the Apple premium for memory increases and SDD size increases. Apple simply charges too much for those upgrades at initial purchase.